Our recent trip to Hillsboro made it easy to come back along a portion of the historic Columbia River highway 30. It was raining and cold, but we stopped at three of the falls on the drive. 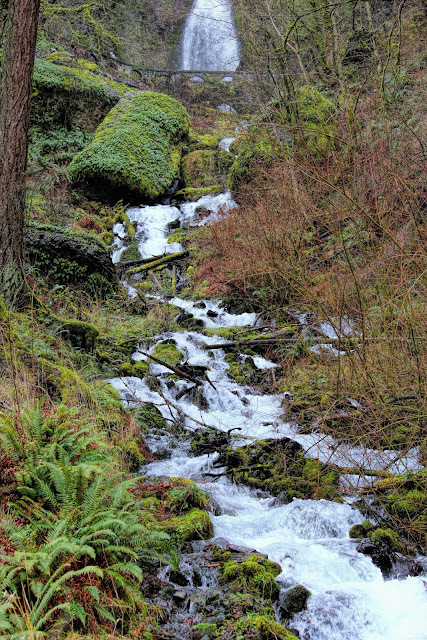 The second was Wahkeena Falls, which drops 242 feet in height from an elevation of 560 feet. On another trip, I'll walk up to the bridge for a totally different perspective. For additional reference, I'm including a photo of the origin of the falls. I've been on that route - so scenic. It was raining part of our drive,too, but we managed to hike some of the falls. It's been a couple of years---- The whole scenic route has become quite crowded in better weather. Nice shots, Evelyn.